These training materials have been developed for users of the WordPress Web Editing system at Saint Joseph's University. Please fill out the short form below (just your email address!) to be contacted when we add additional dates and times. You need to have an SJU account, and you need to have access to the site you want to edit. To get access for editing a site, submit an IT ticket using the "Request Access" form. To get access for editing a site, or to request a new user for your site, submit an IT ticket using the "Request Access" form. When you first log in, you will see a list of all the sites you can edit. If you need access to a site that is not listed, please request access using the IT ticketing system. You can choose to Visit a site, or to go to the editing area (the Dashboard). The "Toolbar" is the top black bar that should appear at the top of your page when you are logged in. The Toolbar provides a quick way for you to access some of the features of your site, as well as visit other sites and switch between the dashboard and front end. What is the area at the top of my dashboard? 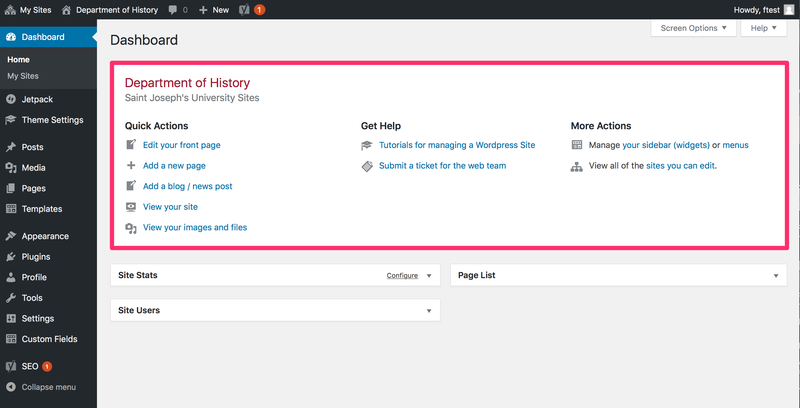 On your dashboard, the first thing you will see is a special "tool hub" that we have created for our WordPress users. This hub lists a number of quick actions that you might want to take on your site; some links for getting help and to this documentation; and some additional site management tools. This has been developed specifically for our Web Editors, and we are happy to change this as needed to help you succeed. Please contact the web services team if you have any ideas for additions to this area. What are the site stats? 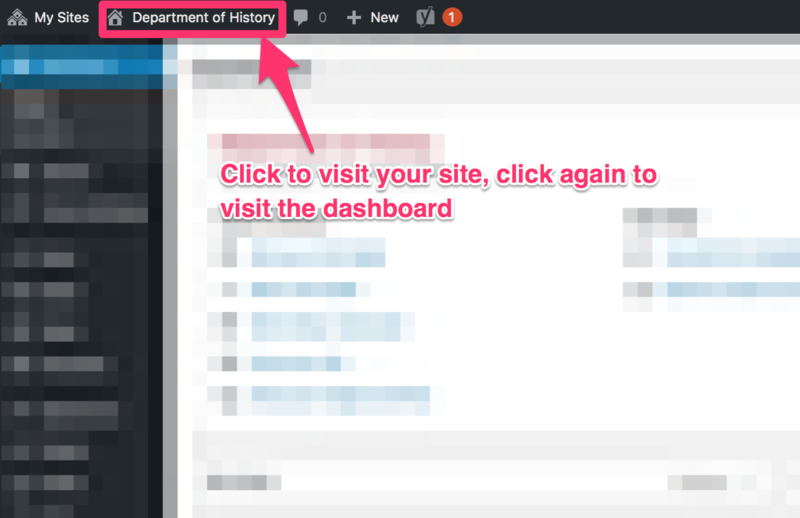 On the dashboard is a small widget area that lists a summary of the recent traffic to your website. If you need additional data, click the "View All" button within the Stats widget. The Web Services team can provide more in-depth results by request. What is the page list? The Page List widget on the dashboard is a simple listing of all the pages on your site, along with some simple information about those pages. This is an easy way for you to see what pages might need an update, or which pages you worked on recently. We encourage all users to keep their websites up-to-date by ensuring that content is reviewed and updated on at least a yearly basis. What is the users list? The Site Users widget on the dashboard lists all users on your website. If you notice that any users need to be added or removed, please contact the Web Services team by submitting a ticket. Articles from our IT Knowledgebase. 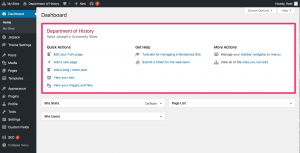 We have created an area for WordPress and Page Builder tutorials. How Do I Make Sure I'm on Brand? We have created a web style guide for you to refer to when making changes. If you have any questions, please submit a ticket here.